At the Yokohama Plant of Victor Company of Japan, Limited, a team of engineers headed by Shizuo Takano and Yuma Shiraishi developed VHS (Video Home System) format. They looked ahead to the need for home video tape recorders and embodied their idea in unique inventions. 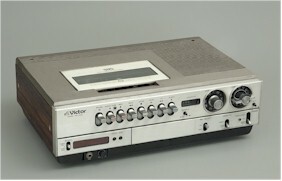 The first model JVC HR-3300 was announced on 9 September 1976. Their basic design with subsequent improvement gained wide customer acceptance. VHS became the world standard for home video tape recorders. The plaque may be viewed at: The entrance hall of of the VHS Commemorative Hall in the JVC Yokosuka Plant, 58-4, Shinmei-cho, Yokosuka, Kanagawa 239-8550, Japan. The hall is open to the public by appointment. Beginning with Valdemar Poulsen’s first magnetic recording of the voice in 1898, magnetic recording and reproduction was first put into practice in the 1930s. In the 1950s, research and development of the videotape recorders for use in broadcasting finally started. In Japan, inventor Kenjiro Takayanagi’s dream to develop a technology capable of storing images on some form of magnetic material was shared by Yuma Shiraishi and Shizuo Takano. They took the task of creating a workable home videotape recorder (VTR) at Victor Company of Japan, Limited (JVC). In 1956, the American company, Ampex, created the first commercial reel-to-reel videotape recorder. The four-head VTR with a two-inch-wide tape had the size of a jukebox. This new device was a major development for television broadcasters because it marked the first time that shows could be recorded and broadcast later. However this unit was too large and complex to operate for average consumers. In 1958, Sony, then a medium-sized but aggressive young company, introduced its own version of the Ampex machine and occupied a major share of the Japanese VTR market. Other companies soon entered the industry, however, armed with new inventions. Toshiba, for example, released a one-head, helical scan VTR in 1959 and one year later, JVC introduced a two-head, helical scan VTR. The two-head system required less ancillary equipment and was reasonably compact. It later became the standard system for home videotape recorders. Still, these units could not attract average consumers due to their prohibitive size and price. Throughout the 1960s, JVC actively participated in the videotape recorder industry. In 1970, the company invented a down-converted color signal recording system. This system was used in the U-format cassette VTRs, standardized and sold by the three Japanese companies of Sony, Matsushita, and JVC the next year. The three companies made an effort to collaborate with one another but the high stake involved in the new technology drove them apart. In the end, they failed to sell this ¾-inch tape recorder to the home-use market. This failure discouraged JVC from pursuing the development of a home-use VTR; in fact, JVC’s corporate leadership withdrew most of its support for the product. Nevertheless, the JVC video products division, led by Shiraishi and Takano, started the development of VHS in 1971. It set out a requirement matrix of twelve goals to meet basic consumer needs. The matrix included, 1) Technical features—compatibility with other manufacturers’ products, two-hour recording time, a wide range of functions, etc., 2) Home-use market requirements—inexpensive price, easy operation, and low running cost, 3) Manufacturer requirements—easy production, compatible VTR parts, and easy service, and 4) Societal requirements—serving as the transmitter of information and culture. Originally VHS stands for Video Home System. 1. Parallel loading mechanism: While U-format and Beta format used one loading pole going around the head drum in a U shape and winding the tape, VHS format adopted the new mechanism, which pulled out the tape into an M shape with two loading poles and wound it onto the head drum. It made compact size possible. 2. DL-FM system: As a newly invented circuit, this system placed a high pass filter, a low pass filter and two limiters prior to the FM demodulator. This invention made high-density recording possible. 3. PS color process: The slanted azimuth recording system, both in VHS and Beta formats, was used to raise the recording density. However, color signal crosstalk could not be eliminated through the azimuth effect. Thus, PS color process was developed to eliminate crosstalk by utilizing the strong line correlation of color signals. Aided by these inventions, VHS was able to obtain broad support from consumers. Its simple structure also made manufacture easy and many manufacturers entered the market for VTRs with the VHS format. The number of VHS VTRs steadily outstripped sales of Beta format VTRs despite its head start. In 1977, the Radio Corporation of America (RCA) launched the VHS format in the United States and the American market contributed to the enormous growth of VHS. The home VTRs grew into a core business for consumer electronics manufacturers, following after color TVs. Accompanying this, the electronic parts industry also achieved major expansion and technological improvements. The development of mass production technology for analog integrated circuits and precision processing technology for head drum are major examples. Furthermore, sales of video software by the major American movie studios exceed box-office revenues and have become a critical business pillar. Without a doubt, it is the diffusion of VHS that has made this possible. Nayak, P. Ranganath and John M. Ketteringham, “The VCR: A Miracle at JVC “Be Very Polite and Gentle”,” Breakthroughs!, Pfeiffer & Company, 1994, 7-34. Shiraishi, Yuma. “History of Home Videotape Recorder Development,” SMPTE Journal, December 1985 Issue, Vol. 94, No. 12, 1257-63. Nikkei Weekly 21 September 1976.